Do you have a traditional Christmas morning breakfast? We make it special, but we don’t eat the same thing every year. This year the girls have been begging for French toast for a while so I picked up a loaf of gluten-free bread and we’re going to do it eggnog-style. With bacon. I (wildly) adapted a cinnamon roll recipe found in Real Snacks by Lara Ferroni. 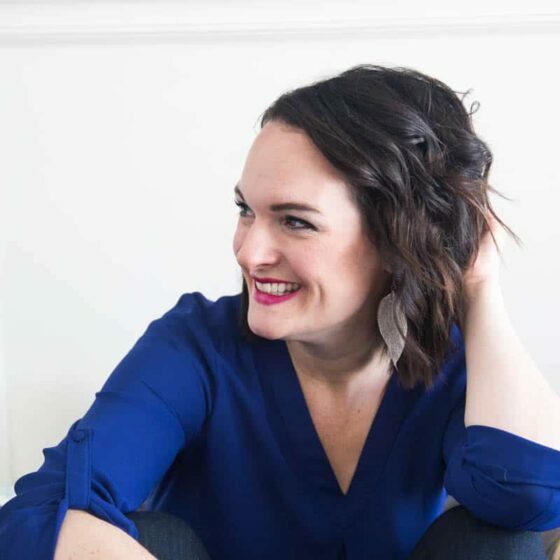 I did a review about Real Snacks a while back and loved the homemade alternatives to a lot of popular store-bought snacks. 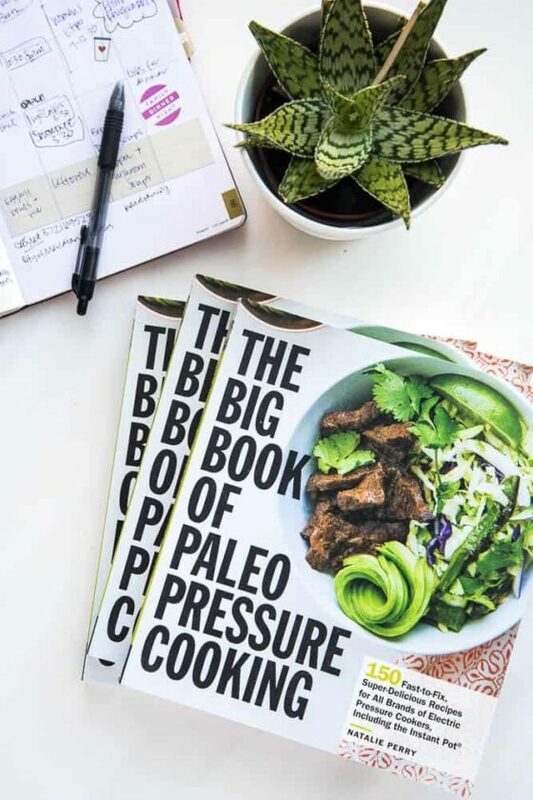 While the recipes aren’t paleo, they’re much cleaner than their store-bought counterparts and she even throws in gluten-free and vegan variations for each recipe. My mom purchased the book after I reviewed it and was the first to try out her cinnamon rolls, which have become a favorite of my 4-year-old niece when she comes to visit. I’ve made them several times myself, tinkering with flour combinations, but I wanted to make these grain-free. These aren’t your typical yeast-raised cinnamon rolls. They’re more biscuit-y. And the dough is pretty soft and wet — like thick mashed potatoes. 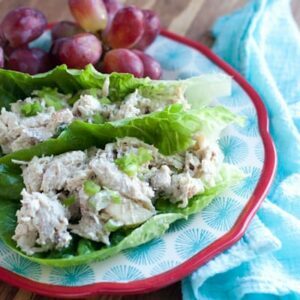 When you roll them up, it helps to have a piece of parchment or wax paper underneath. I was reminded of rolling sushi as I pulled the parchment up and used it to roll the sticky mess into a log-shape. It really does work. And I highly recommend doing it this way. I would probably end up throwing the dough across the room if I tried to roll it straight off the counter. Honest. They don’t look very cinnamon roll-like, but if you have any experience with paleo baked goods, you’ll learn to lower your expectations when it comes to appearance. Looks really are deceiving though because these babies, once topped with a super-easy Apple Cider Syrup (which may or may not be technically paleo — hey, it’s Christmas! ), are super good. I was thrilled at the texture! 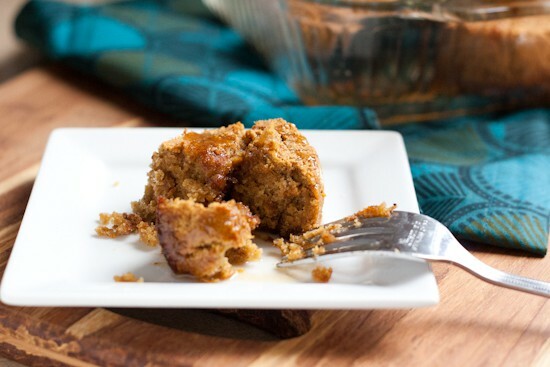 They’re soft and a little crumbly, but sticky enough to hold together well. 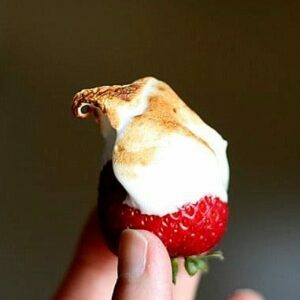 And perfectly sweet. If you’d rather have scones, try these Low Carb Pumpkin Scones from Carolyn at All Day I Dream About Food! They’re even grain-free. 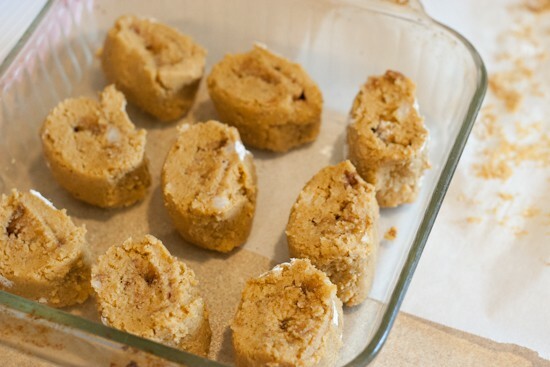 Paleo Pumpkin Cinnamon Rolls! These gooey, aromatic rolls are a perfect fall breakfast. Don't forget the cider glaze on top! Combine the almond flour, arrowroot powder, coconut flour, pumpkin pie spice, baking soda, and sea salt in a large bowl. Whisk to combine. 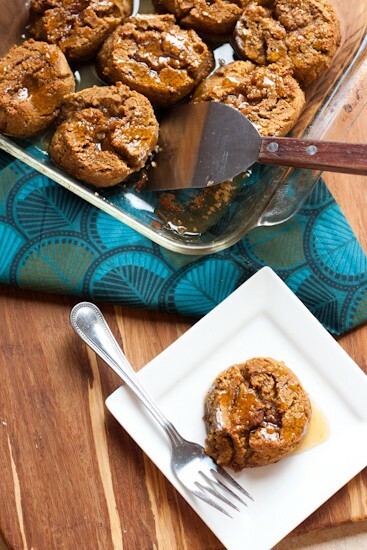 In a smaller bowl, whisk together the pumpkin puree, eggs, 5 Tablespoons of honey, coconut oil, and vanilla extract. Pour the liquid mixture into the dry and mix well. Let it sit for 10 minutes to give the coconut flour time to soak up some moisture. Mix again. The mixture should be the consistency of thick mashed potatoes. 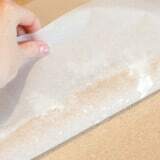 Lay a large piece of wax paper or parchment paper on your counter. Sprinkle with arrowroot powder. 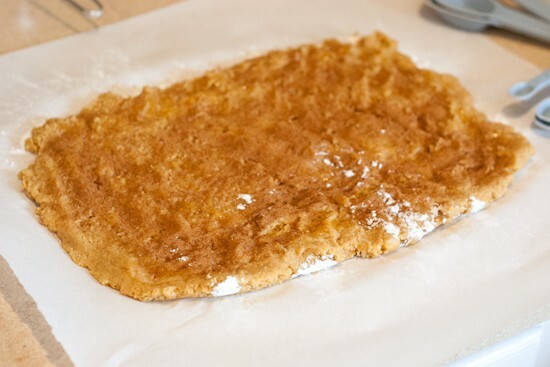 Transfer the dough to the paper. Rub some coconut oil on your hands and gently press the mixture and form it into a rectangle. It should be about 1/2 inch thick. It'll be pretty wet. 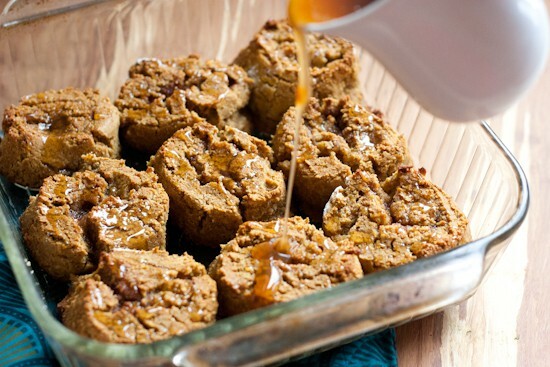 Drizzle 1 Tablespoon of honey and sprinkle 1/2 teaspoon of cinnamon evenly over the top. 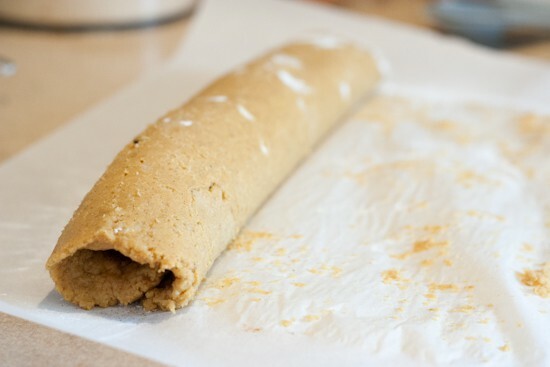 Lift the edge of the paper closest to you and use your other hand to help the dough roll into a log. (See photos in post.) If you've ever rolled sushi, it's the same idea. Peel back the paper once the mixture is all rolled up. Slice the log into 9 sections and lay them, swirl-side up, in the prepared baking pan. Yes, they look like lumps of mush. Don't worry, it'll be OK in the end. Bake for 30-35 minutes or until firm to the touch and they begin to brown slightly around the edges. 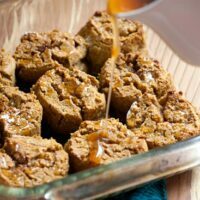 Drizzle with cider syrup, honey, or maple syrup and serve! Nat's Note: To make cider syrup, boil a quart of unsweetened apple cider until it reduces to one cup. This will take 35-45 minutes. Let it cool and store in an airtight container until ready to use. Keeps for a couple of weeks. If you started the cider before you start the cinnamon rolls it would be finished around the same time. Well they may not be like regular cinnamon rolls, but WHO cares. They look pretty special to me. 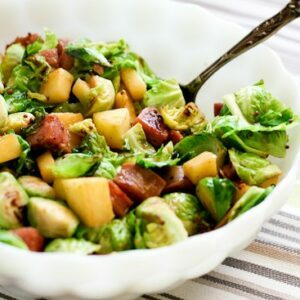 Great for Xmas breakfast, but a treat for any Sunday brunch too. Yum, yum! These look deeeeeelish! « Previous Post8 Simple Homemade Gifts in Under 30 minutes!